Nature’s vegetation offers an endless supply of organic matter for use in my artworks. I create images by forming alliances between a variety of plants and photographic emulsions. I call these images 'Biochromes' because the natural occurrence of decomposition on the photographic materials results in an array of colourful pigmentation arranged in complex and detailed compositions, aided by natures own creative skill. The chemical and biological reactions that take place during the process of decay are fundamental to my image making process. This art and science endeavor traces the activities of the microbes; reveals the complex process of decay while addressing its metamorphic power. My work also combines my interests in macro and aerial imaging of the environment. While my practice builds on the traditions of botanical illustrations and experimental photographic techniques, my 'fertilisation' of photographic materials, using vegetation, directly focuses on the significance of time and change through organic decay and regeneration, pushing the boundaries of the photographic medium. My current research project focuses on Australian medicinal plants. My research paper was published in the Studio Research Journal in July 2014 (access it from TEXT page). Renata Buziak, born in Poland, moved to Australia in 1991. 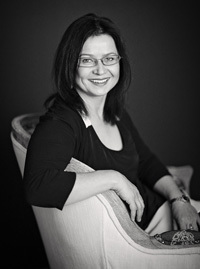 In 2006 Renata has completed her Bachelor of Photography with First Class Honours at Queensland College of Art (QCA), Griffith University, Brisbane, and PhD research in 2016. Renata is also a a sessional academic at QCA and Queensland University of Technology (QUT). Renata’s experimental biochrome work has been exhibited in solo and group exhibitions, nationally and internationally, including ANCA Gallery in Canberra, Red Gallery in Melbourne, the Queensland Centre for Photography (QCP), the Perth Institute for Contemporary Art (PICA), Blender Gallery in Sydney, Photo LA, The Opole Contemporary Art Gallery, Academy of Fine Art in Warsaw and more. Renata was a recipient of a number of art awards including The Thiess Art Prize and the Royal Brisbane Women’s Hospital Art Award; she completed several artist residencies: Botanica at the Brisbane Botanic Gardens Mt Coot-tha, TreeLine: People, Art, Science, Nature at the Caloundra Regional Gallery, 100 Futures at the KGSC, Lines in the Sand Arts Festival on North Stradbroke Island. Renata’s work is held in public and private collections (listed below). In 2014 Renata was invited to exhibit at the 4th Biennale Ars Polonia in Opole, Poland, an international showcase of works by artists of Polish heritage. Her monogram Renata Buziak: Afterimage was launched in 2010 by the QCP, and her research paper published in the Studio Research Journal in July 2014. 2007 – 2018: Photography Tutor & Lecturer of courses listed, Sessional Academic, Queensland College of Art (QCA) Griffith University, South Bank Brisbane QLD: Studio Foundations (Photographic Concepts), Studio Lecturer; Studio Foundations (Photographic Concepts), Tutor; Art Infield Project I & Art Infield Project II, Lecturer; Photo Methodologies: Fundamentals, Tutor; Photo Technologies, Tutor; Darkroom Project, Tutor; Art Infield Project I & Art Infield Project II, Tutor; Experimental Photo Techniques, Tutor; Digital Visualisation / Digital Imaging, Tutor (Adobe Photoshop). Visitor Experience Team member (Engagement and Learning), Museum of Brisbane; Alumni Internship, Griffith University Art Museum; Advisory Working Group member, Art in Soil, Soil Science Australia initiative, QLD; Photography Department Administrative Officer, QCA Griffith University; Marketing/Art Consultant, Queensland Centre for Photography, Bulimba QLD; Gallery Manager, Higher Art Gallery, Paddington QLD; Assistant to Curator, Joel Fine Art Auction House and Gallery, Paddington QLD; Activity Assistant Children’s Art Centre, Gallery of Modern Art (GOMA) QLD; Voluntary Staff Member, Queensland Centre for Photography, QLD. Regional Arts Development Fund (RADF) Moreton Bay Regional Council (Habitat project). New Scientist Eureka Prize for Science Photography, Australian Museum, NSW; This is a nationally touring exhibition throughout 2008-09. The venues: The National Science and Technology Centre Questacon, Canberra ACT, Scitech West Perth, Australian Centre for Photography Sydney NSW and RMIT Gallery Malbourne VIC. PHOTO COMPENDIUM Launch and Exhibition, Spot81, 81 Abercrombie Street, Chippendale NSW. Please check Text tab on this website. In Anna’s Garden, exhibition catalogue, MGA, VIC. Solitary Performance, SILVERSHOTZ 2017 FOLIO ANNUAL, December 2017, pp. 38-43. Nature Continually Ablaze: Renata Buziak’s Medicinal Plant Cycles@ Gaffa Gallery, Daniel Pateman, exhibition review, London Photography Diary, March 2017; and in Eyeline magazine, #87, Nov 2017. 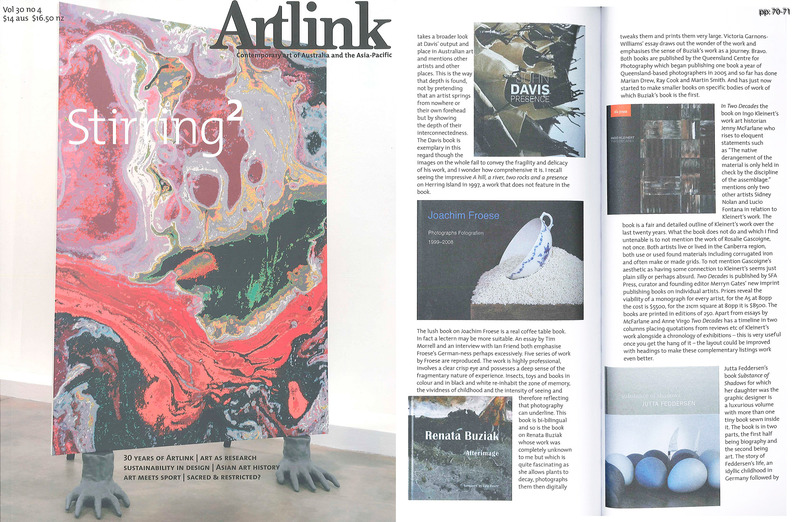 Renata Buziak: Unfolding Rhythms II, Carol Schwarzman, exhibition review, Artlink, August 2016. Land Dialogues, James Farley & Christopher Orchard, Exhibition Catalogue, Wagga Wagga Art Gallery, 2016. Cast by the Sun, Donal Fitzpatrick & Stephanie Lynn Rogers, Queensland College of Art, Griffith University / Tyler School of Art, Temple University, 2015, pp. 10, 16-17. Presence and Boundaries in the Garden, Dr Stephen Hobson, Habitat Exhibition Catalogue, Rough Paper Press, 2015, pp. 2-3. Artist Talk Time-lapses Renata Buziak, Soundscapes Vanessa Tomlinson, video Simon Marsh, Panoptic Press, Jan 2015. PHOTO COMPENDIUM AUSTRALIA II 2014, Black Mountain, pp. 164-167. Ogród, Louise Martin-Chew, Hayward Fine Art exhibition catalogue, 31 October 2014. Biochromes and Healing Plants: Transdisciplinary Studio Research, Renata Buziak, Studio Research Journal, Issue #2, July 2014, pp.44-55 (pdf). 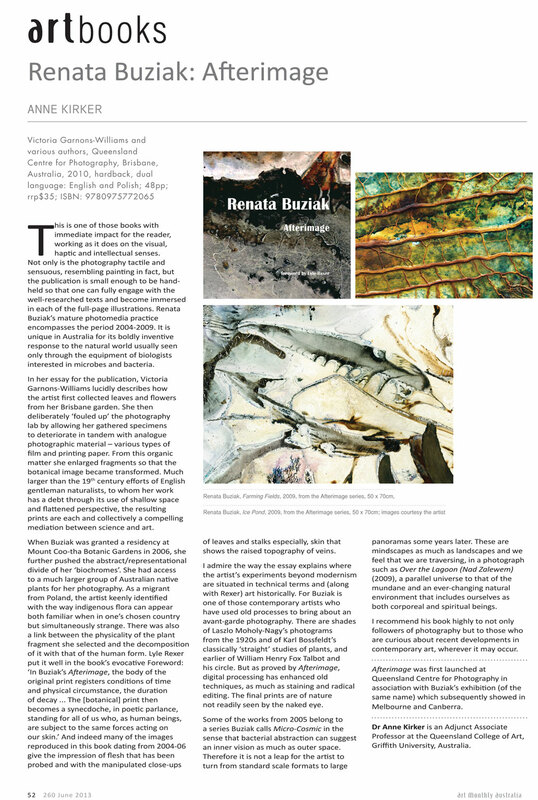 renata buziak’s ‘afterimage’ exhibition review, Vanessa Wright, Lip Magazine, 24 May 2013. AUSTRALIAN PHOTOGRAPHY AND GALLERY COMPENDIUM 2011, Daylight Productions, pp. 88-89. Boomerang Polski, K. Bajkowski 'Biochromy Renaty Buziak' (in Polish). 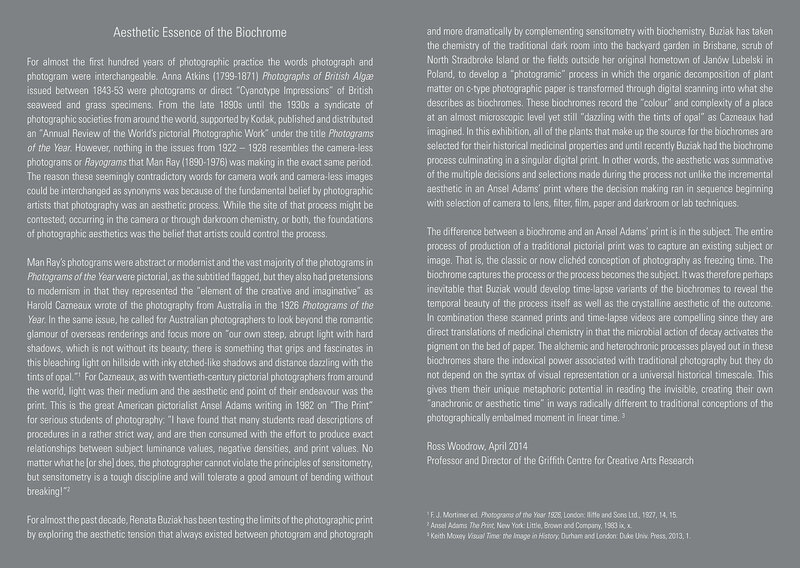 Look: Contemporary Australian Photography since 1980, A. Marsh, Macmillan Publishers, pp. 195, 379.